So earlier this week we had reports that scrumhalf Conrad Hoffman of the Sharks Currie Cup/Super Rugby outfit was being looked at by Leinster for a possible 3-month deal as cover during the World Cup. Nothing has been formally announced as yet, but as it's an off week we decided to have a look at his career and performances throughout the Super Rugby season just gone to get an idea what kind of role he could play in D4 should he make the journey. Well for the first, easy part of the research, we did the whole Wikipeadia thang. Chap's been around - coming up at Western Province and moving on to the Stormers in Super Rugby yet with just the 1 appearance between 2008 and 2011 it would appear injury may have hampered him - he came back to top action with Natal and bar for a 2014 stint in Canberra with Jake White's Brumbies has been there ever since. 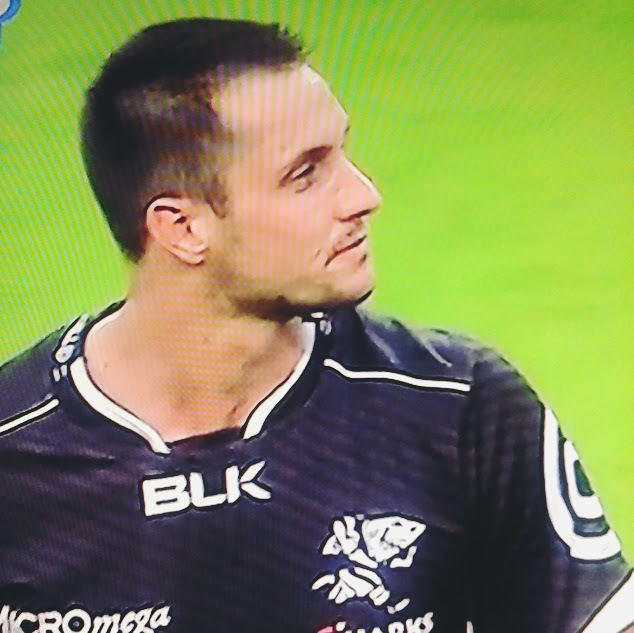 Then we looked at the Sharks' disappointing 2015 Super Rugby campaign to see how much action he saw. It wasn't much. Just the one start against the Force at the end of March - the rest of the time he was a little-used sub, mostly making 2- and 3- minute cameos at the end of matches. He wasn't able to dislodge the regular starter Cobus Reinach. But that wasn't enough for us...we wanted to actually see him in action so we got a recording of that clash with the Force where he got all of 60 minutes from the kickoff, playing as halfback alongside Francois Steyn. Yeah - let's just say I could see why he was getting so little game time. OK - maybe that's not ALTOGETHER fair on the chap...it was altogether a dismal outing for the Sharks where they couldn't muster a single point in the first half and however mediocre Hoffman was, Steyn was worse. Just looking to do a piece providing a bit of fan-driven info on Hoffman but first maybe you can give a brief description of Sharksworld and its history? Now to Mr Hoffman - I had a look at his one Super Rugby start last season against the Force...would I be right in saying "Ruan Pienaar he ain't?" That's some brilliant info thanks Rob! Now enough about soon-to-be-ex-players-you-care-about lol one final question before we wrap - how are the Sharks looking for the Currie Cup this year? Great stuff. Well many thanks for the taking the time for the chat Rob and best of luck to the Springboks for the World Cup...here in Ireland we'll look forward to meeting you in the final haha! I wish I felt at all confident that we'll get that far, mate! But thanks all the same! So there you have it. With Pro 12 and B&I matches to cover during the World Cup I guess he's just about the guy we need - hopefully priority will be given to the likes of Luke McGrath and Nick McCarthy but from the looks of it Hoffman will be well aware of where he will fit in.